This summary laminated sheet of Greek Grammar beyond the Basics and Basics of New Testament Syntax is perfect for students to review categories of uses and look over possibilities when doing exegesis of the New Testament. The Basics of New Testament Syntax provides concise, up-to-date guidance for intermediate Greek students to do accurate exegesis of biblical texts. Abridged from Greek Grammar Beyond the Basics: An Exegetical Syntax of the New Testament, the popular exegetical Greek grammar for studies in Greek by Daniel B. Wallace, The Basics of New Testament Syntax offers a practical grammar for second-year students.The strengths of this abridgment will become quickly apparent to the user: -It shows the relevance of syntax for exegesis and is thoroughly cross-referenced to Exegetical Syntax.-It includes an exceptional number of categories useful for intermediate Greek studies.-It is easy to use. Each semantic category is discussed, and a definition and key to identification are provided.-Scores of charts and tables are included to enable the intermediate student to grasp the material quickly. As the basis of modern translations of the Scriptures, biblical Greek and lexicography are disciplines vital to our understanding of the original Christian message. This volume, which celebrates the career of Frederick W. Danker, presents the state of the art in Greek and biblical language studies. Amid the important topics of discussion are how one discovers the meaning of words, current tools available to students of language, and the approach being used in the latest New Testament and Septuagint Greek dictionaries. 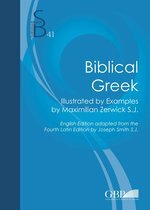 Added features of this book include appendices listing current Greek-English dictionaries and grammars and current Greek dictionary and language projects as well as indexes of biblical references, Greek and Hebrew words, and grammatical terms. The success which attended the Latin Graecitas Biblica from its first (1944) to its revised and enlarged fourth Edition (1960) suggested the advisability of an English translation. The purpose of the present treatise was not so much a purely scientific or philological one, as that of encouraging future ministers of the Word to have recourse to the original Greek text. 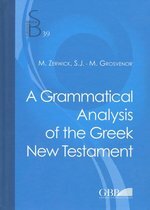 This accounts for the multiplication of examples to illustrate the exegetical importance of the study of the Greek and also for the fact that attention has been given almost exclusively to points of syntax, morphology being relegated to a few remarks in the Conclusion (M. Zerwick S.J.). 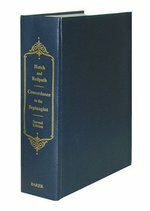 Hendrickson's The Complete Hebrew-Greek Bible combines under one cover the complete text of the Hebrew Bible and the Greek New Testament. Ideal for pastors, students, scholars, and anyone else who has studied both Greek and Hebrew, this is an excellent volume for those who want a complete original-language Bible in an attractive package and at an affordable price. The Hebrew text is a beautifully typeset version of the Biblia Hebraica Leningradensia, edited by Aron Dotan. - A straightforward, unobtrusive apparatus is found at the bottom of the page that presents the differences in wording between the Westcott-Hort edition and the 27th edition of Nestle-Aland's Novum Testamentum Graece, as well as the Byzantine text edition prepared by Maurice Robinson and William Pierpont. - Each definition of each word has been carefully reviewed and, where deemed necessary, revised. - A system of cross-referencing between related Greek words has been introduced. - As a didactic, mnemonic, and phonetic device, compound words are divided by small upright lines. - The maps of the UBS Greek New Testament are included. For over one hundred years, this resource has been an indispensable tool for biblical scholars. Now back by demand, the second edition includes an extensive Hebrew index by internationally renowned Septuagint scholar Takamitsu Muraoka, which lists all of the Greek words used to translate each Hebrew and Aramaic word. This edition also includes an introductory essay by Septuagint scholars Robert Kraft and Emanuel Tov and an improved system for utilizing the appendices. 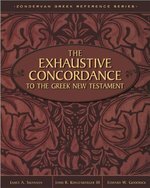 For Greek students, scholars, instructors, and others whose use of the language goes beyond the rudimentary, The Exhaustive Concordance to the Greek New Testament supplies an exhaustive index to every Greek word found in the New Testament. 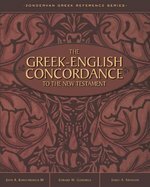 This concordance is based on the fourth edition of the United Bible Societies' Greek New Testament (UBS4). length of each context line has been determined by the need for meaningful contexts. Many contexts are two lines long. occurring phrases are noted. * Every word in the Goorick/Kohlenberger numbering system has its own entry--even variants that do not occur in UBS4 are noted as variant readings and defined. * All NIV variants are noted, making this an exhaustive concordance to UBS4 as well as the Greek text behind the NIV. * All cognate relationships within the New Testament are shown. * The definite article and a handful of conjunctions and particles are indexed without context lines. Zerwick-Grosvenor has become, much to the surprise and gratification of its publishers, a minor classic in its genre. It is a brief verse-by-verse grammatical commentary on the Greek text of the entire New Testament. 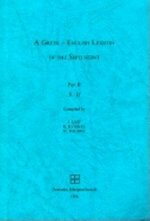 Originally published in Latin in the 1950s under the title Analysis philologica Novi Testamenti graeci with Fr. Maximilian Zerwick as its sole author (Scripta Pontificii Instituti Biblici, 107; third edition, 1966), it was completely rewritten and translated into English by Zerwick and Miss Mary Grosvenor in the 1970s under the present title A Grammatical Analysis of the Greek New Testament (fifth, revised edition 2007 [published outside series]). (The word edition refers to relatively minor changes in the text over the years, changes mainly consisting in the correction of typographical errors.) The Analysis is intended for use by beginning students of New Testament Greek who have attained a certain competency in the use of the language. Thousands of copies have been sold in all parts of the world. The present edition is the first in the series Subsidia Biblica. The text of the 2007 edition is reproduced unchanged. The insertion in Subsidia Biblica is intended to make the work more accessible and to enlarge the text to facilitate consultation. Robert W. Funk, in translating this long-established classic, has also revised it and, in doing so, has incorporated the notes which Professor Debrunner had prepared for a new German edition on which he was working at the time of his death in 1958. Dr. Funk has also had the co-operation of leading British, Continental, and American scholars. The translation places in the hands of English-speaking students a book that belongs in their libraries and in the libraries of every theologian, philologist and pastor alongside the Gingrich-Danker "Greek-English Lexicon." 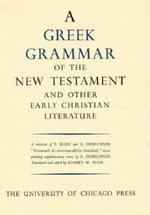 This grammar sets the Greek of the New Testament in the context of Hellenistic Greek and compares and contrasts it with the classical norms. It relates to the New Testament language to its Semitic background, to Greek dialects, and to Latin and has been kept fully abreast of latest developments and manuscript discoveries. It is at no point exclusively dependent on modern editions of the Greek New Testament text but considers variant readings wherever they are significant. It is designed to compress the greatest amount of information into the smallest amount of space consistent with clarity. There are subsections discussing difficult or disputed points and copious citations of primary texts in addition to generous bibliographies for those who wish to pursue specific items further. 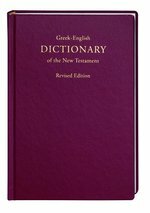 The Greek-English Concordance to the New Testament is an exhaustive index to three Greek texts: UBS4, Nestle-Aland 26, and the Greek text underlying the New International Version of the Bible. It replaces the venerable Englishman s Greek Concordance by George Wigram, published over 150 years ago. 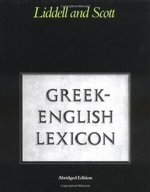 FEATURES: * Lists all occurrences of a given Greek word (even where there is not a direct English equivalent) in Greek alphabetical order * Shows the interrelationship between the English and Greek texts, including redundant cognates and repeated Greek words, as well as multiple-word translations * Uses the Goodrick-Kohlenberger numbering system (with cross-reference to Strong s numbers), allowing for accurate identification of Greek words and use with The Zondervan NIV Exhaustive Concordance * Keyed to the Bauer-Arndt-Gingrich-Danker Greek Lexicon (BAGD) and The New International Dictionary of New Testament Theology (NIDNTT) * Exhaustive NIV-to-Greek index * Includes a phrase concordance for phrases such as Son of Man, kingdom of God, etc." Described as an "invaluable reference work" (Classical Philology) and "a tool indispensable for the study of early Christian literature" (Religious Studies Review) in its previous edition, this new updated American edition of Walter Bauer's Worterbuch zu den Schriften des Neuen Testaments builds on its predecessor's staggering deposit of extraordinary erudition relating to Greek literature from all periods. Including entries for many more words, the new edition also lists more than 25,000 additional references to classical, intertestamental, Early Christian, and modern literature. Danker's edition of Bauer's Worterbuch will be an indispensable guide for Biblical and classical scholars, ministers, seminarians, and translators. 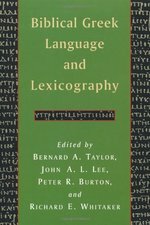 This complete lexicon supercedes its two earlier editions (1993; 2002). The entire Septuagint, including the apocrypha, is covered. For the books of Samuel, Kings, Chronicles, and Judges the so-called Antiochene edition is fully covered in addition to the data as found in the standard edition by Rahlfs. Also fully covered are the two versions of Tobit, Esther, and Daniel. Based on the critically established Gottingen edition where it is available. If not, Rahlfs's edition is used. For close to 60% of a total of 9,550 headwords all the passages occurring in the LXX are either quoted or mentioned. A fully fledged lexicon, not a glossary merely listing translation equivalents in English. Senses defined. Important lexicographical data such as synonyms, antonyms, idiomatic expressions, distinction between literal and figurative, combinations with prepositions, noun cases, syntagmatic information such as what kind of direct or indirect objects a given verb takes, what kind of nouns a given adjective is used with, and much more information abundantly presented and illustrated with quotes, mostly translated. High-frequency lexemes such as prepositions and conjunctions fully analysed. Data on contemporary Koine and Jewish Greek including the New Testament taken into account. Morphological information provided: various tenses of verbs, genitive forms of nouns etc. Substantive references to the current scientific literature. An indispensable tool for students of the Septuagint, the New Testament, Hellenistic Judaism, and the Greek language. Originally published in 1953, this book was written to provide a companion to the syntax of the New Testament. It does not set out to be a systematic guide, but gives sufficient material for the student acquainted with the language to form opinions on matters of interpretation involving syntax. Notes are incorporated throughout. This book will be of value to anyone with an interest in biblical studies and the language of the New Testament. This abridgement of the world's most authoritative dictionary of ancient Greek is based on the 1883 revision. It includes some discussion of word usage, citing examples and characteristic phrases. Generally speaking, only words used by late writers and scientific terms have been omitted from the full lexicon. From Homer downwards, to the close of Attic Greek, care has been taken to include all words, as well as those used by Aristotle, Plutarch in his Lives, Polybius, Strabo, Lucian, and the writers of the New Testament. 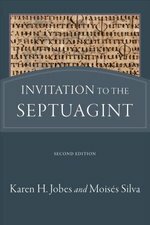 This comprehensive yet user-friendly primer is useful to those who are just beginning to study the Septuagint. Now in paperback, the book explores the history of the Septuagint, the various versions available, and its importance for biblical studies. This comprehensive yet user-friendly primer to the Septuagint (LXX) acquaints readers with the Greek versions of the Old Testament. 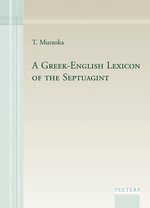 It is accessible to students, assuming no prior knowledge about the Septuagint, yet is also informative for seasoned scholars. The authors, both prominent Septuagint scholars, explore the history of the LXX, the various versions of it available, and its importance for biblical studies. 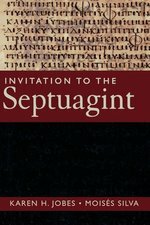 This new edition has been substantially revised, expanded, and updated to reflect major advances in Septuagint studies. Appendixes offer helpful reference resources for further study. 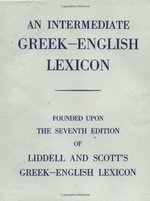 The classic Greek lexicon which has proved invaluable to generations of Greek Testament students and scholars.It provides for each New Testament word its derivation, the Hebrew it represents if found in the Septuagint, its original and derived meanings with illustrations from biblical, classical and modern Greek, the general sense in which it is used in the papyri, its grammatical constructions, and references to other works in which it is discussed. There are also appendices of the irregular verbs of the Greek New Testament, and an alphabetical list of verbal forms.